We revised forecasts following in-line 4Q18 results. CAPITALAND MALL TRUST (SGX:C38U) has worked hard on its recycling efforts; Westgate deepens its long-term suburban footprint while a rejuvenated Funan should support DPUs. Retail sector fundamentals are still soft, with near-term demand-supply balance to be tested by Jewel’s opening in Mar 2019. We introduce FY21 estimates and roll-forward our DDM-based Target Price to SGD2.25 (WACC: 6.8%, LTG: 1.5%), HOLD. CapitaLand Mall Trust’s results reinforce our positive bias towards suburban/ outlet malls. FRASERS CENTREPOINT TRUST (SGX:J69U) remains our preferred retail REIT given its strengthening suburban mall footprint, visible growth drivers, strong balance sheet and potential acquisition catalysts. CapitaLand Mall Trust’s 4Q18 revenue rose 4.7% y-o-y/5.8% q-o-q and NPI grew 4.3% y-o-y/1.4% q-o-q with the consolidation of Westgate and improved portfolio occupancy, which increased q-o-q from 98.5% to 99.2% at end-Dec 2018. 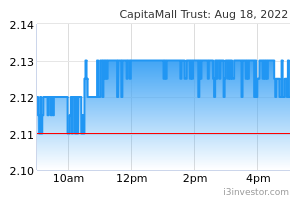 CapitaLand Mall Trust reported a +0.7% rental reversion for FY18, up slightly from +0.6% for 9M18, and versus -1.7% for FY17. Shopper traffic declined 0.9% y-o-y whilst tenants' sales rose 0.5% y-o-y which was attributed to the stronger performances at its suburban malls. Tenant sales growth was led by sporting goods (+11.5% y-o-y) and jewellery & watches (+5.9% y-o-y), while leisure and entertainment (-9.1% y-o-y) and IT & communications (-9.2% y-o-y) were the weakest. Occupancy cost dipped marginally from 18.5% to 18.4% in FY18; we expect near-term rental growth to remain stable. AUM rose 12% h-o-h at the annual half-year revaluation, primarily due to the completion of Westgate acquisition (70% interest); there were no changes in cap rate assumptions in 2H18. CapitaLand Mall Trust’s FY18 was marked by its divestment of Sembawang Shopping Centre (at a 3.9% cap rate), followed by the acquisition of its remaining 70% interest in Westgate from its sponsor (at 4.3% NPI yield). Following the deal completion, gearing has risen to 34.2% as at end-Dec 2018. Funan is set to open in 2Q19, with pre-committed occupancies based on leases signed and in advanced negotiations at 80% for its retail and office components and we expect revenue contribution from 2H19. Other DPU drivers include recently-completed AEI works at Westgate and Tampines Mall.